Austrian company KTM is known as an off-road motorcycle brand, being deeply involved in the powersports racing scene. 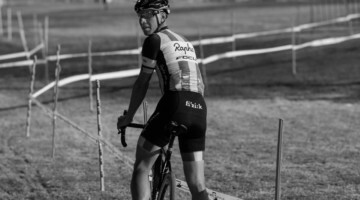 But they also make a full line of bikes, including a cyclocross bike. 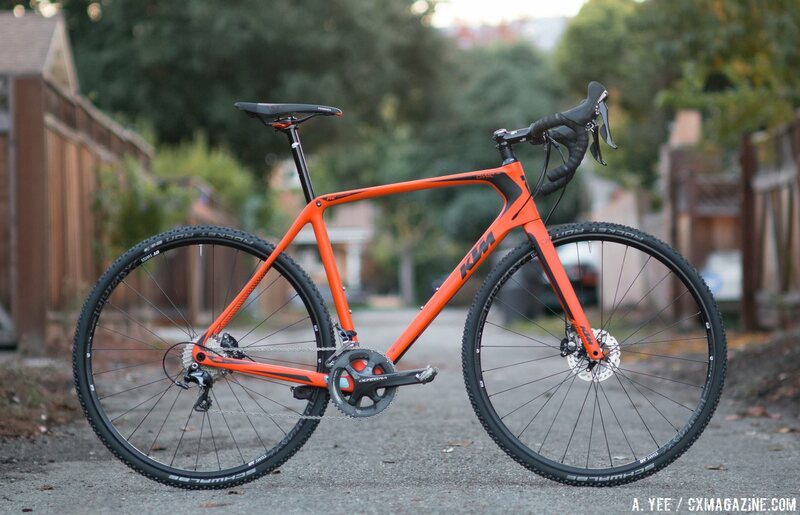 We received a 2015 Canic CXC, one of KTM’s two top-tier carbon cyclocross bikes, in addition to their aluminum offering. 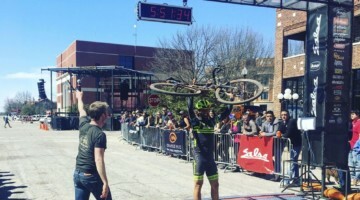 The top two models differ only by paint and equipment, one being a single ring setup, the other with an Ultegra double ring up front, which was the model we tested. The Canic has a rather unique frame shape. 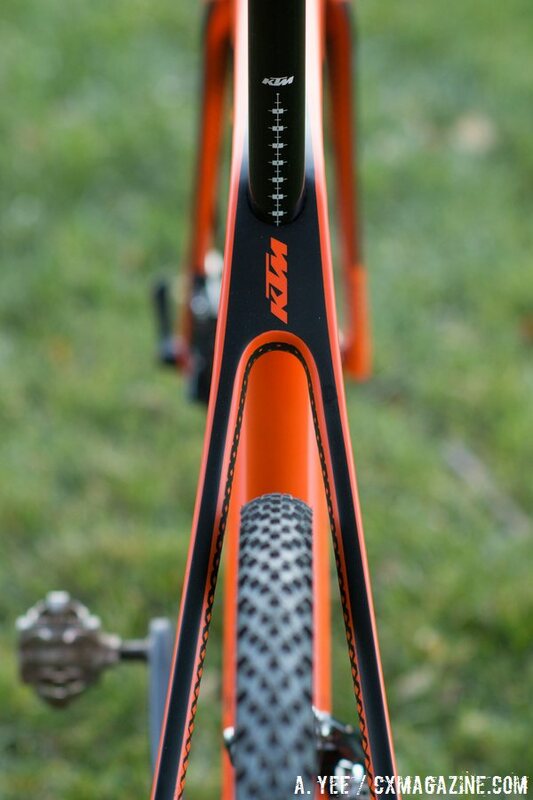 This, along with KTM’s striking matte orange paint gives the bike a distinctive look that attracts comments wherever we ride it. 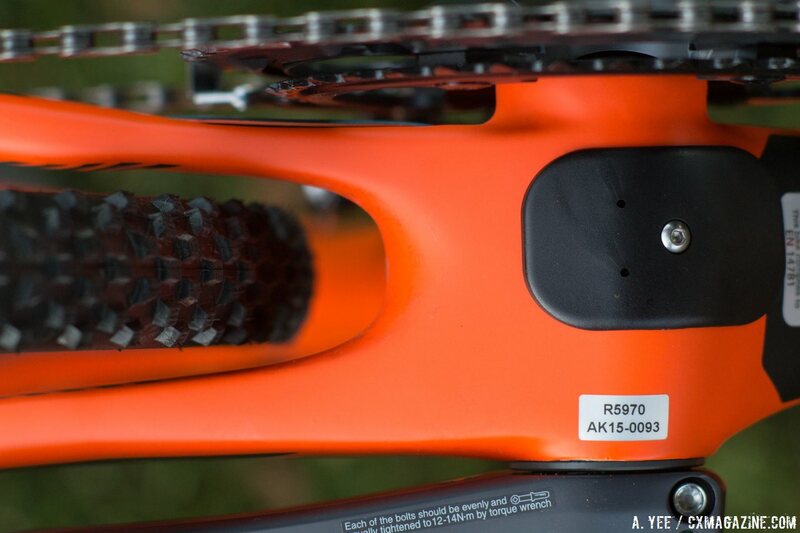 The rear end is 135 X 12mm thru axle, but for 2016, the rear end will get a dimensional change to 142 X 12mm thru axle following the new mountain bike standard. 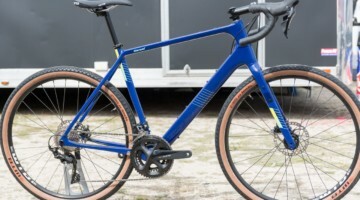 Other dimensions are fairly standard for cyclocross bikes these days with a 71.5-degree head tube angle paired with a 74-degree seat tube. 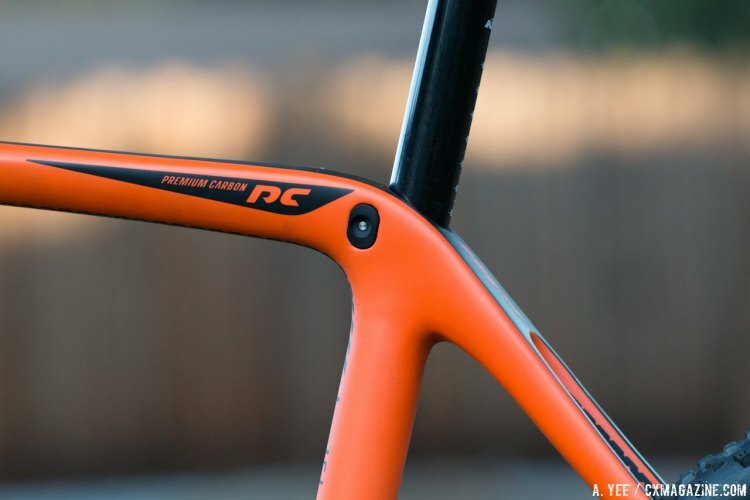 The 42.5cm chainstays add up to the 102.3mm wheelbase, yielding a front center that leans to the longer side of normal. Our 55cm test bike features a 571mm stack, and 392mm reach, 9mm less stack and 1mm less reach than a 56cm Van Dessel Full Tilt Boogie, for comparison. KTM Canic CXC cyclocross geometry chart. 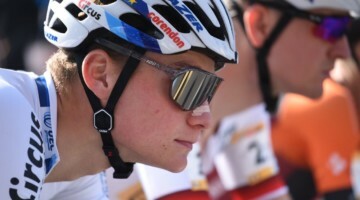 The head angle does increase by half a degree on the largest two frames. The included all carbon fork has slender blades and is 15mm thru axle with a steerer that flares to 1 ¼” at the crown. The BB is a PressFit 86 with a trap door beneath to access the internally routed cables and brake lines. Small metal reinforcing inserts are on the left chainstay and left fork blade for the brake caliper mounts. And the frame sports dual bottle bosses as well as internal cable routing. 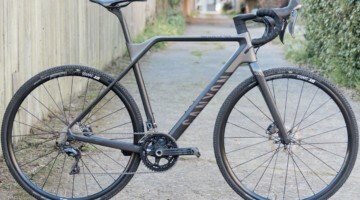 The Shimano build has an entire Ultegra 6800 drivetrain with ST RS 685 mechanical shifting hydraulic levers and disc brake calipers with 140mm RT-99 IceTech rotors front and rear. Shimano cyclocross 46/36 chainrings are paired with an 11-28 Ultegra 6800 11-speed cassette. 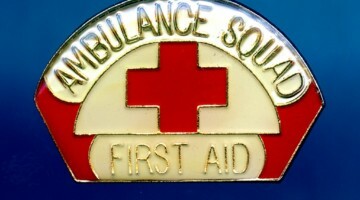 From past experience, it’s hard to find fault with these reliable, high-performing component choices. Braking is superb, and shifting is precise. 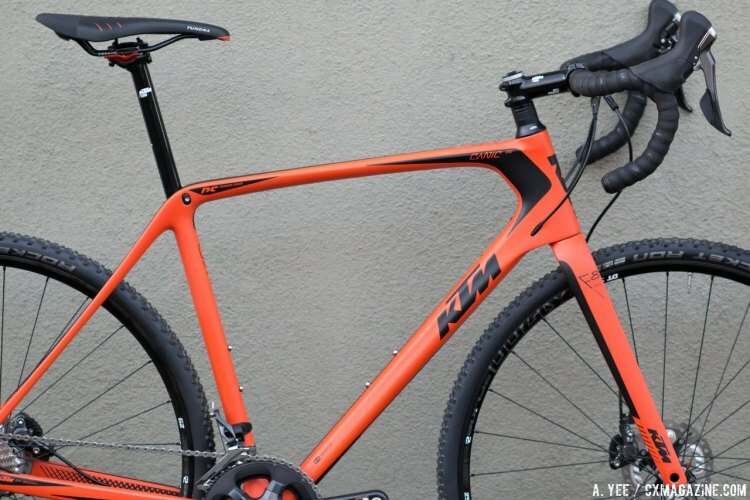 KTM provides their own brand of aluminum stem, ergo-curve bars and a nice seatpost with a 2-bolt clamp—no slipping saddle angles here. The wheelset is DT Swiss’s X1700 Spline tubeless alloy Centerlock disc with non-tubeless Schwalbe Rocket Ron 33mm tires. More on that combo later. Equipped as is, without pedals, the bike weight is 18.9 pounds with DT Swiss wheels (with tubes) and 11.9 without wheels. First, some comments about the build. 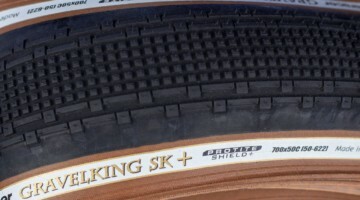 Supplying tubeless wheels without tubeless tires is a miss, in our book. 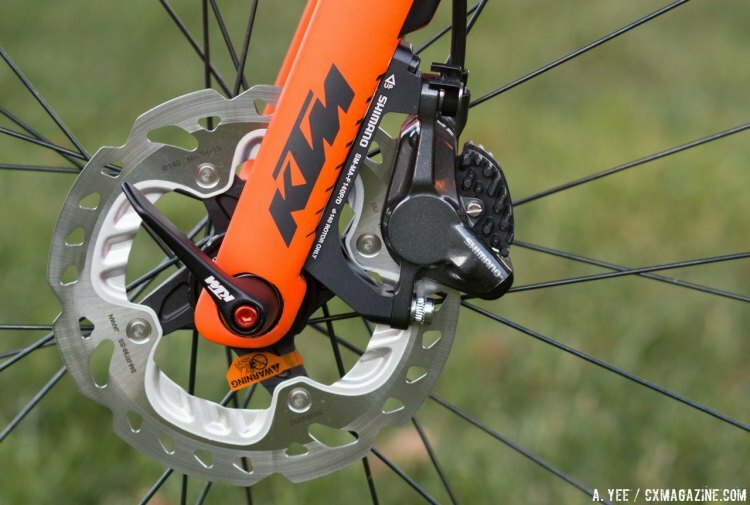 Although the DT Swiss wheels aren’t our favorite option for easy, burp-free tubeless use, KTM leaves new owners deflated by cutting corners and supplying the bike with a non-tubeless Schwalbe Rocket Ron clincher. 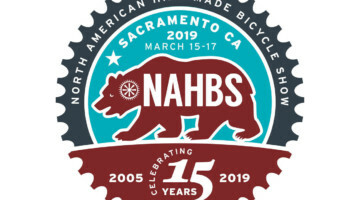 Plan on spending a bit more if you want to pair your tubeless wheels with tubeless tires so that you can ride low pressure or avoid goat head flats. Money can buy new tires, but it can’t change your axle configuration, and that leads us to our bigger complaint with the odd choice of the 135mm thru axle out back, as owners will be able to swap wheels with exactly no one. 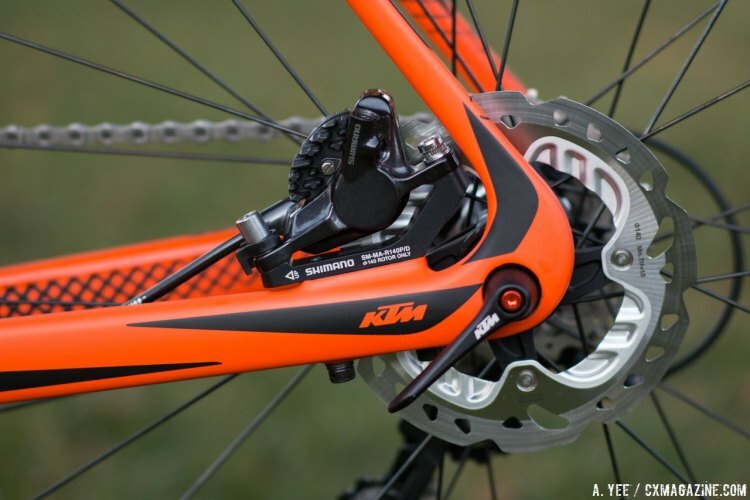 KTM has already realized its misstep and said the 2016 model will have the much more common 142x12mm thru axles, but this model is stuck in no man’s land. 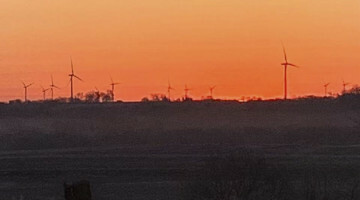 Companies can’t always predict where the dust will settle with technology trends, but still, it seems like no other company thought the 135mm thru axle would be a good choice, so it’s hard to give the Austrian company a pass. It’s worth mentioning that this model is built around obsolete technology, and that could be a deal breaker for many. 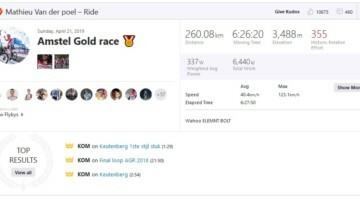 Perhaps if you found this 2015 model on blowout, it’s worth dealing with this nearly-proprietary axle configuration, especially if you don’t plan to swap out wheels or use neutral support at a race, but the choice is limiting. 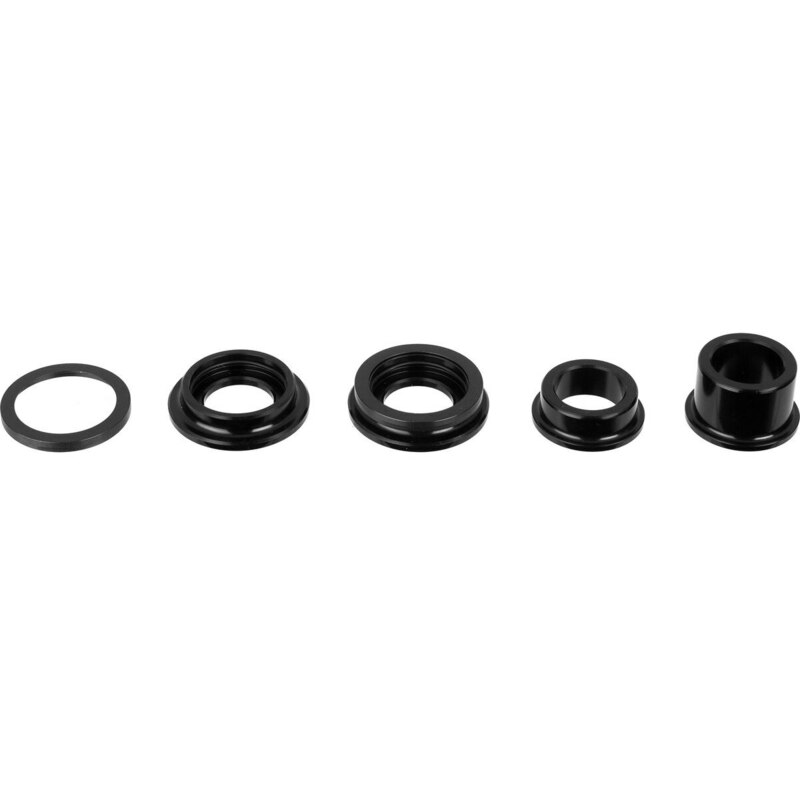 Also, while we were fans of 15mm thru axles up front, which allows sharing one set of wheels with non-Boost mountain bikes, unfortunately it seems like 15mm is losing out to 12mm. 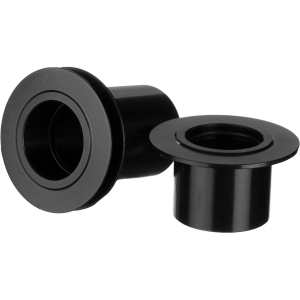 The 15mm thru axle fork will likely be another out-of-date choice, albeit one that is reasonably easy to address as many wheels offer swappable end caps that will convert 12mm wheels to 15mm. 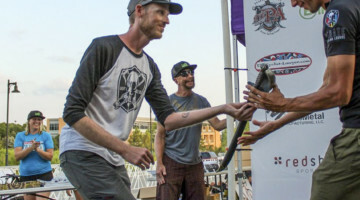 Now that we’ve gotten those odd choices out of the way, we have to admit, it’s not like you can tell the difference between a 135mm and 142mm thru axle or between a 15mm and 12mm front thru axle when riding—at least we couldn’t. 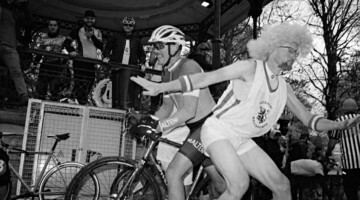 Any stiffness gains requires more wattage or better-calibrated legs than what we’re equipped with. We’ve spent some racing and riding time on the Canic and are impressed with the rocketship-like qualities of the bike. 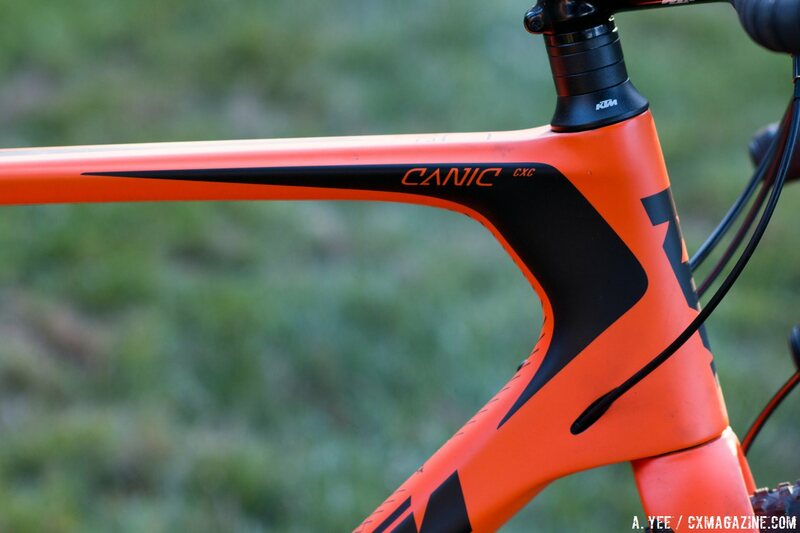 The Canic is ready to race, with modern, short chainstays and yet long enough head tubes that accommodate a range of flexibilities and ages—not only super, low-slung positions. The front end of the bike is plenty stiff—point it where you want to go and it complies immediately—but you’ll also feel most bumps in the rough stuff. Get up to sprint and there’s no twisting up front. 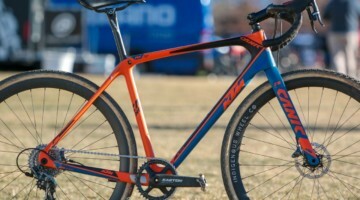 The fork matches the frame in rigidity—it might look svelte and comfy—but that’s likely partly due to the black trailing edge in the graphics package that offers a flattering profile. 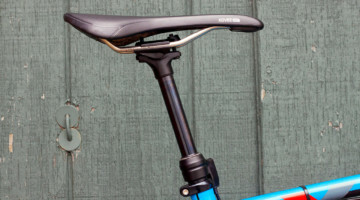 The sloping top tube and compact rear triangle are equally stiff, kept laterally rigid with the thru axle, but the ride isn’t as rigid as you might expect, perhaps in part due to the low, hidden seat post clamp and generous amount of 27.2mm seat post exposed. 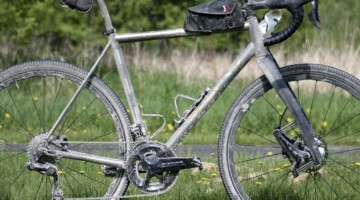 It’s not a Trek Boone, and there’s no bearing pivot, but the concept is the same: More post allows more flex. 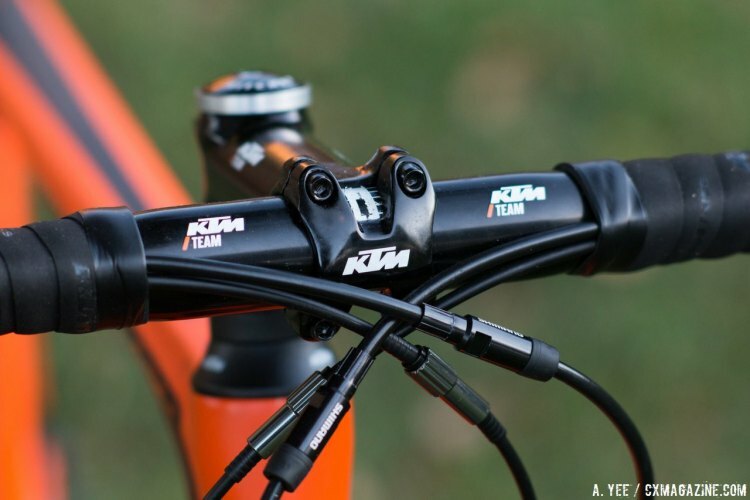 It also helps that KTM opted for the smaller, 27.2mm diameter, even if it limits dropper post options. 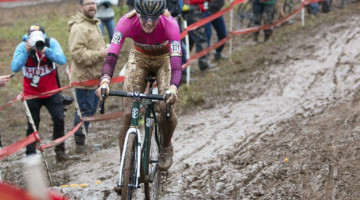 Mud and tire clearance is decent for cyclocross racers—but if gravel is your thing—you may not be able to fit your favorite 42mm knobbies in the Canic CXC. 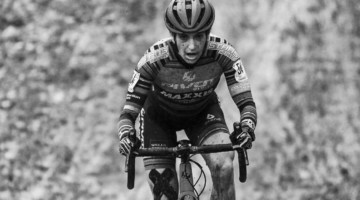 That is a bit of a bummer, because the Canic CXC has adopted the modern, lower bottom bracket heights we’re seeing on many bikes. 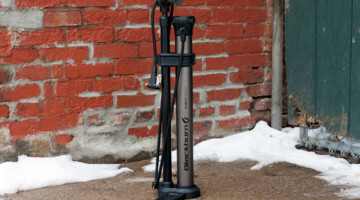 With a low BB drop at 72mm for all but the two biggest sizes (it moves to 70mm and 68mm for the largest two sizes), the Canic is well-suited for the larger volume cyclocross and gravel tires that are now available without making you strike a ballerina pose at the start line or stop light. 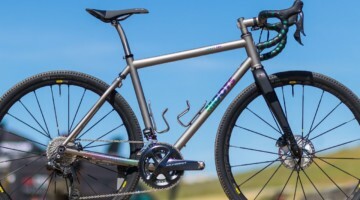 We’re in a transitional time when some companies are building race-specific cyclocross bikes, while others are building bikes that are aimed to tackle both cyclocross, gravel and perhaps even a bit of “adventure” and monster crossin’. 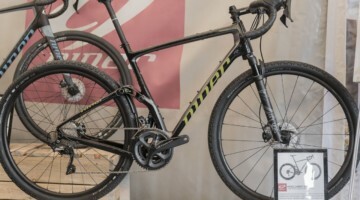 There’s not a distinct line between such types of bikes or categories, but as more and more gravel tires are unveiled in 40mm or wider sizes, if you’re hoping to ride gravel and be future proof, tire clearance is yet another area where the Canic might be a little behind the times. 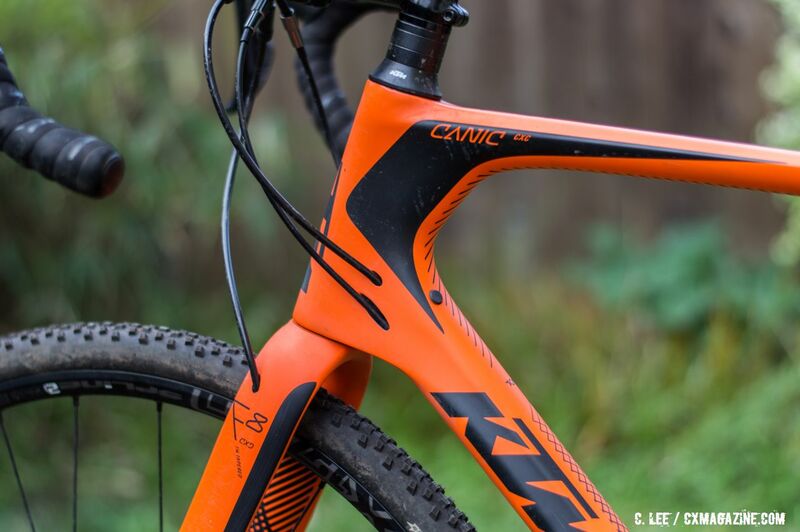 The Canic CXC is, in our opinion, decidedly a cyclocross race bike, and it does that well. 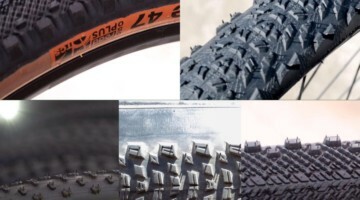 We suspect the 2016 version, with the reconfigured 142mm rear axle, and expected swap to Schwalbe X-One tubeless tires, will address some of our complaints. 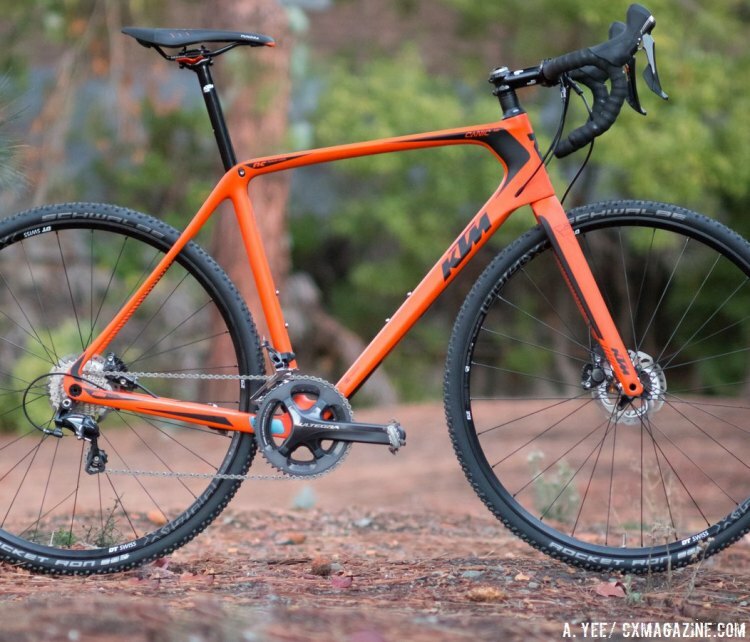 If you’re eyeing the KTM Canic CXC as your next cyclocross race bike and tend to roll on 35mm or narrower rubber, we suspect you’ll be pleased. 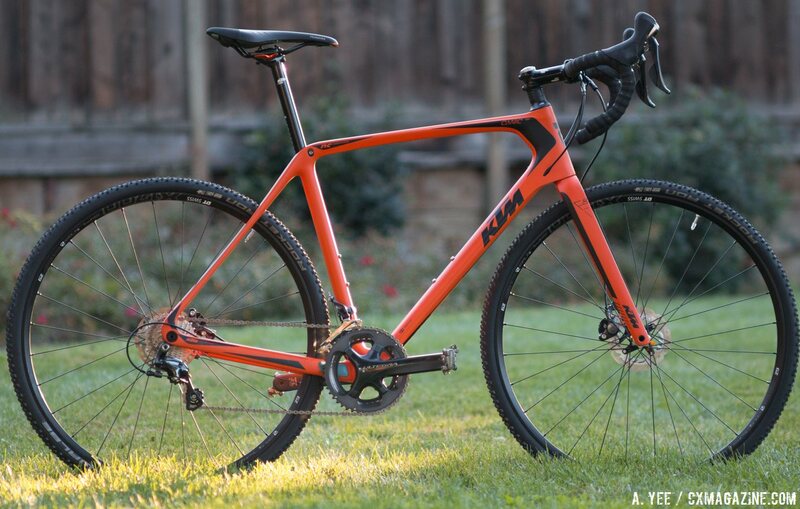 cyclocross KTMUSA but what’s the biggest motor you can get on this thing? Awesome bike. I’ve essentially converted this to a road bike by changing tires and breaking sprinting records in my neighborhood. You can totally piss people off by passing their $20,000 aerobikes with a bright orange cyclecross. They need matching TT handlebars for this rig!